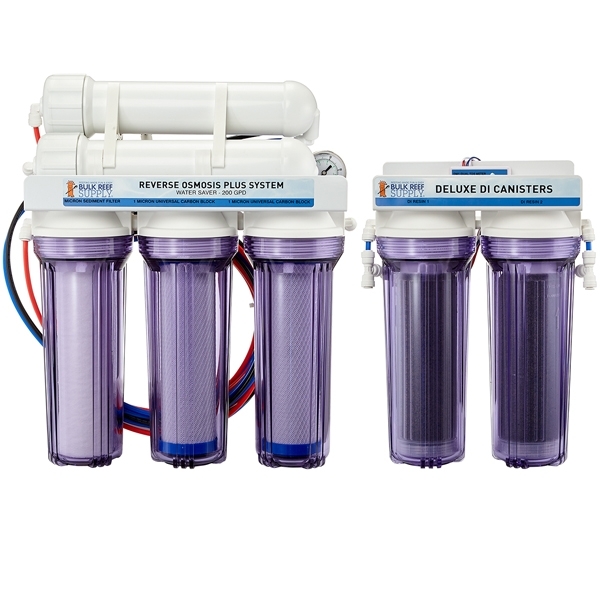 Bulk Reef Supply Reverse Osmosis Deionization Systems only take a few minutes to have connected and making purified water. All of the plumbing on the RO/DI unit will be complete and all you will need to do is connect the tubing to a suitable source water connection, and direct the product and waste water lines. BRS 6 Stage RO/DI systems have 1 sediment filter, 2 carbon blocks, 1 membrane, and 2 deionization stages making them perfect for well water, and virtually all types of city water that is treated with chlorine or chloramines. Connect the Blue product water tubing that is attached to the RO systems body to the dual DI canisters input fitting.